Despite some well-intentioned giggles among his classmates, that moment was a wake-up call for the procrastinator. It’s important for teachers, counselors and parents to ensure that students don’t graduate with no idea what they’re doing next. It’s nice to know adults can all clearly delineate for teens the main options for how to sail into an independent life following high school graduation by following some professional advice, so that’s why GATE has placed this article on post-graduation options. Even without a professional college admissions counselor supporting them, all students deserve to know what’s what. The following tips are presented for students. We hope you’ll want to share them by forwarding this link. Do not have mom, dad or a counselor communicate with the school on your behalf once you’ve been admitted unless there is a compelling reason you cannot handle it yourself. Admissions offices often see this as a red flag of dependency just at a time they hope the young adult they’ve accepted is ready for autonomy. 2. Check your email frequently. Colleges often send emails regarding freshman orientation, enrollment dates, advisement appointments and other pertinent information. Make sure they have your best address (i.e. the one on your smart phone). This is especially important for students entering a university with a large undergraduate student body or impacted major. Classes can fill up very quickly, appointments become scarce, and a lot can become lost in the shuffle when a college is handling thousands of students. 3. Log onto your school’s website regularly to research newly posted information. You need to be on the look out for when you should be receiving your student identification number. It’s your responsibility to know when/where enrollment dates are posted online. Once you’re in their system, it will also grant you access to scholarship opportunities offered directly by the school that may be accepting late applications, give information on clubs you may wish to join with summer orientations (sometimes online), and more. 4. If you are taking out a student loan, log into your FAFSA account. Be sure to have your parents file as soon after the October 1st start date as possible. There’s even a “My Student Aid” mobile app where this can be completed on a smart phone. While you will have to accept any loans granted through your college’s website, you must go through mandatory loan counseling and sign a master promissory note or your funds will not be released. Failure to do both mandatory FAFSA requirements can delay your loan release, which can make enrollment problematic and very stressful. Two-year community colleges are often the unsung heroes of academia. Many of them have outstanding professors and top-notch resources. This is a great option for students who are unsure about their specific academic interests or those who want to get their grades up and transfer into a school with standards for entering freshman that are rigorous beyond their current levels. It’s also a viable option for students whose families face financial challenges since per credit, the courses are so much less expensive. Why not save money and avoid accruing a hefty student loan debt? Submit your school application on their website and complete the online orientation. The earlier you do this, the more likely it will be that you can set up an appointment with a counselor. Counselors are particularly important at two-year colleges because they help you to map out a curriculum that will maximize your chances of a successful transfer into the university you want to attend. All four-year transfer requirements are different, and these counselors can help you navigate your path and get into all of the classes you need. Don’t assume you can easily get into all classes. With the economic instabilities of the past several years, many community colleges have seen an increase in applicants that have left classes bursting at the seams. Avoid having to stand in line to enter a (literal) raffle for a popular, mandatory freshman math or English class by planning and applying early. 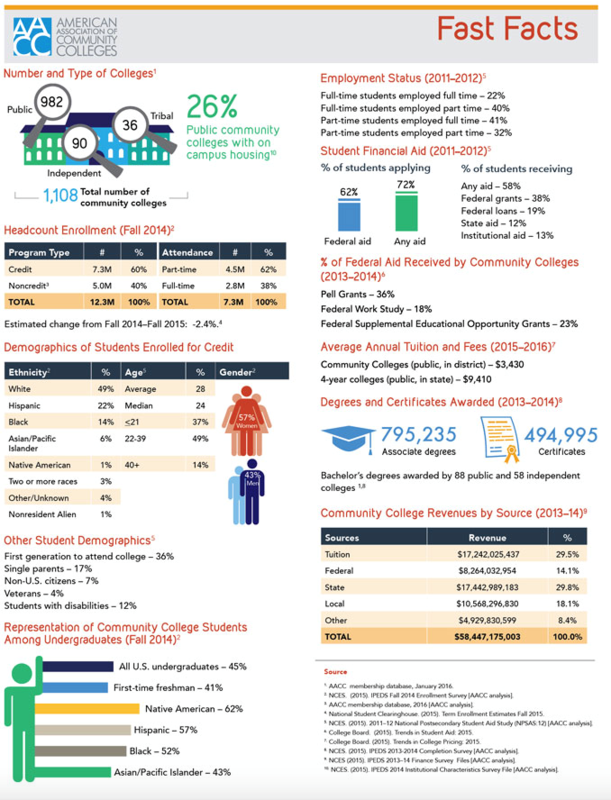 Here are some handy statistics to guide you, as created by the American Association of Community Colleges. This underused path offers ideal opportunities, often quite lucrative, for students with more hands-on interests. There are many different kinds of trade schools. These are institutes that offer training in arts and sciences including all things culinary, cosmetology, mechanical, electrical, plumbing, drilling, and fashion-related. You can be a special effects makeup artist, healthcare technician, alternative medicine practitioner and more. Every year there are people who attend four-year universities only to realize a career offered by a vocational school was their true calling all along. If you are already enrolled in a vocational school, be sure to do the following. Check in with your school to find out tuition due dates, orientation and class requirements. Make sure your school of choice has the proper accreditation for licensing. Ask the school if they have housing resources or where there may be postings for students looking for a roommate. Find out all of your licensing requirements and make sure your educational path is aligned with them. Ask a counselor about internships with professionals working in your field of choice. Research the typical income levels and costs affiliated with the type of work you’ll be asked to perform. Budget accordingly. If you have not already chosen a school, ask your high school counselor for program recommendations. Or, better yet, start asking people in your community about the work they do that interests you. They may let you shadow them during a work day or even take you on as an intern. Want to explore another part of the world…now? Many students feel overwhelmed by having to immediately transition into another school setting. The main challenge is ensuring you have tangible goals and timelines rather than a general sense of fog and postponement of the inevitable business of launching towards an independent life. If you are going to travel, make a plan that involves what you intend to do professionally. Strategically use that travel time to get more informed about your career path. You can learn about yourself as well as the world while you are away. Set goals and keep a journal or blog to demonstrate to future admissions persons or employers how you utilized this transitional time in your life. Talk your plans through with a parent, guardian, or trusted adult to be sure you can personally and financially afford to do this. A gap year can be a very meaningful and valuable life experience if you have a plan for what you hope to achieve and how those achievements will help you to your long-term goals. Post-secondary education is a smart bet for those students who want to explore academia or hone their skills in a hands-on vocation, but school is not for everyone. Some students feel it is best to transfer straight into the workforce. If you are planning on getting a job directly after high school, think about the following important tips. Start doing research about your profession. The more you know about the details, the more likely you are to find your niche. You want to make sure you know about opportunities for growth and the best path to maximize your career. Network. Any career recruiter will tell you that personal connections are the best asset you can have when hunting for a job. Ask your friends and family members to make introductions for general interviews. General interviews are a great way to ask people in your field about the tips, pros and cons of their work. Make a savings plan because the earlier you start saving, the more options you can secure for yourself. Plan to save at least 5% of your income every month and build that figure into your budget. Set a financial goal for yourself for the end of the year. It’s far too easy to spend as you earn, and end up with little to show for it. One 12-month period with no savings becomes two, and next thing you know you are wanting to start a family with few resources to do so. Think ahead! No 25-year-old wants to be stuck in a low-paying job. Certain paths are not right for certain people, but having the right information can inoculate a student against the most common mistakes cited here related to post-graduation options. Good luck, and remember to subscribe to receive more free trainings on the GATE College System YouTube page.